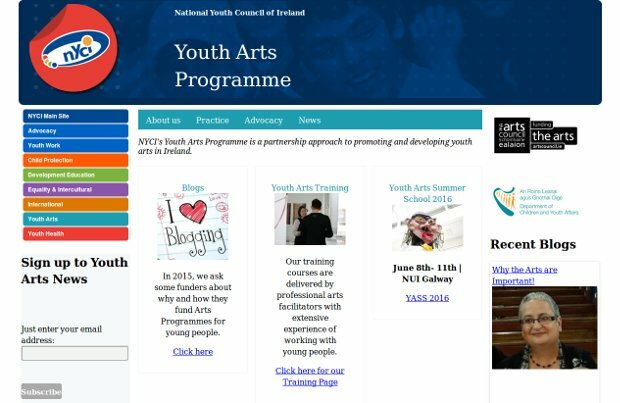 The National Youth Council of Ireland’s Arts Programme is a partnership approach to promoting and developing youth arts in Ireland. NYCI’s Arts Programme aims specifically to realise the potential of young people through good quality arts practice in the youth service and to develop appropriate policies and activities at local, regional and national level. Here are three of their programmes: The Artist in Youth Work Scheme. Co-funded by the Arts Council and the Department of Education, Youth Affairs, The Artist in Youth Work Scheme is offered as a means of extending and enhancing opportunities for young people to experience the arts in the non-formal education sector. The Artist in Youth Work Residency. An Award that aims to encourage artistic collaboration between professional artists and young people. Young people will have the opportunity to work with and learn from practitioners of excellence in their field. Equally, artists will have the opportunity to enrich their own professional practice through the contextual experience of working with young people. The Youth Arts Development Award is offered to further sustainable development of youth arts practice at a local level. The aim of the Youth Arts Development Award is to encourage the formation of partnerships between relevant agencies and organisations at a local level, to work towards integrated development of long-term youth arts programmes in a specific geographical area.